Another successful turnout as we celebrated Chinese New Year with 80+ students, friends and family. We went to the Liverpool Tai Pan Oriental Buffet on Saturday 9th February during dinner hours and enjoyed the fantastic food and drinks served. We would like to wish everyone a Happy Chinese New Year! You can see our photos for the Chinese New Year 2019 dinner here, or read more about our Chinese New Year Dinner 2019. To reserve a place or to enquire about joining any of these beginner classes, please email us liverpooltaichi@gmail.com. We are accepting new beginner Tai Chi students for the classes below. We do not offer pay-as-you-go or drop-in sessions. To try a class, you will be required to pay for 4 consecutive taster sessions in advance and the price for each class is different. Please do not just turn up to any of our classes in person and expect to join right away. Here are the dates and costs for the next intake of beginners class starting in 2019. We recommend you enquire as early as possible as places fill up very quickly. To register for the 4 taster sessions, please email us at liverpooltaichi@gmail.com. Please note that we do not offer pay-as-you-go or drop-in sessions (except where otherwise stated). Also, only cash and cheque payments are accepted. We do not accept credit/debit card payments. To check availability for other classes not listed above, please email us at liverpooltaichi@gmail.com. All courses run in consecutive weeks (except Bank Holidays). Course and membership fees are non-refundable. If we have to cancel a lesson(s), then the fee for that particular lesson(s) will be carried forward to the next term. Course tutors may be substituted due to holidays, illness and other commitments. We are planning to start new morning and evening classes in Skelmersdale and Ormskirk. To register an interest please contact us asap. The Kam Lau School of Tai Chi Chuan would like to wish all students (past and current) a Merry Christmas and Happy New Year! We would like to thank each and every one of you for choosing us as your school of choice for learning and practicing Tai Chi and Chi Kung, and hope you will continue to do so in 2019! We hope you stay safe and have a lovely break over the Christmas period. See you all soon! 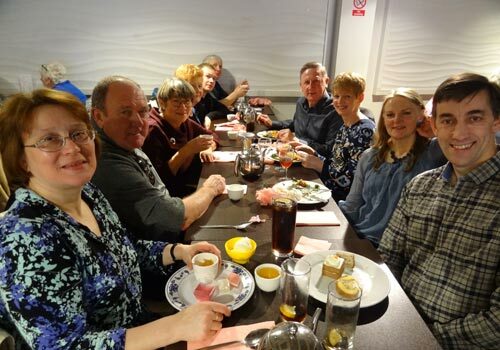 On Saturday 11th February 2018, we held our annual Chinese New Year Celebration dinner at our favourite buffet restaurant, the Tai Pan Buffet in Liverpool. Once again we would like to thank everyone who came to support the dinner and event and hope you all had a fabulous time along with the great food available. See the photo gallery for the Chinese New Year dinner. We held our Chinese New Year dinner for the school on Sunday, February 5th 2017 at the Tai Pan Buffet Restaurant. Thank you to everyone for coming to lunch and supporting our annual dinner. We hope to see many of you back again next year! See the photo gallery for the Chinese New Year dinner, or read more about our Chinese New Year Dinner 2017. Our Tai Chi self defence & applications class on Tuesday in Childwall, Liverpool is open to members of the school who have trained with us for at least 6 months. This practical Tai Chi class is mainly for participants who are only interested in learning Tai Chi as a martial art. To join this class, you must first contact us to check for availability. We offer a trial block payment to beginners at £90 for a 10 week term. Apologies, but we do not accept pay-as-you-go payments. Parking: Free parking is available within the grounds. Our senior students took part in our Chen style spear workshop on Sunday 18th September 2016. Being their first time learning this weapon form, it was a challenge to most of them as a lot of the movements are very difficult to do! See the spear workshop gallery, or read more about our Spear Workshop 2016. The Kam Lau School of Tai Chi Chuan from Liverpool took part today at the British Open Tai Chi Competition in Oxford. We focused our training for the Push Hands competition (fixed step and moving step) and our team came back home with 3 silvers and 2 bronze medals!! You can read more about the British Open Tai Chi Competition 2016. As we do every year, the Kam Lau School of Tai Chi Chuan arranged another dinner to celebrate Chinese New Year 2016 with our students. This year we celebrated the Year of the Monkey with about 80 of our students. See the photo gallery for the Chinese New Year dinner, or read more about our Chinese New Year Dinner 2016.